(CNN) – Mike Huckabee is weighing in on the Sarah Palin v. Michelle Obama face-off when it comes to suggesting nutritional guidelines for Americans – and he's taking the First Lady's side. "With all due respect to my colleague and friend Sarah Palin, I think she's misunderstood what Michelle Obama is trying to do," Huckabee, who has long documented his own battle with weight said Tuesday on the "Curtis Sliwa Show." Huckabee's comments come in response to a remark from Palin on her TLC reality show Sunday during a scene in which the former Alaska governor is seen making s'mores - the not-so-healthy dessert of chocolate and marshmallows. "[This] in honor of Michelle Obama, who said the other day we should not have dessert," Palin quipped as she served up the tasty treat. But it's not the first time Palin has taken a jab at Mrs. Obama over her campaign to discourage fattening foods, especially from public schools. The former vice presidential nominee told conservative talk radio host Laura Ingraham last month that "the first lady cannot trust parents to make decisions for their own children, for their own families in what we should eat." 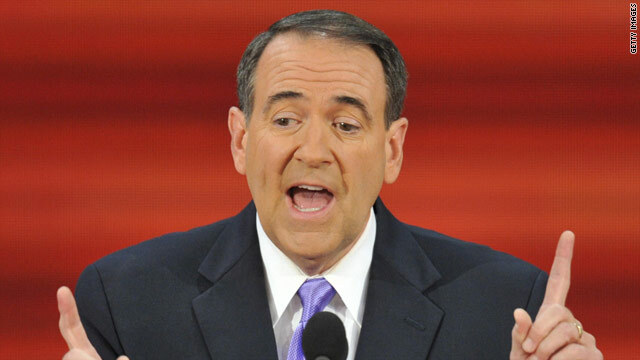 Meanwhile, Mike Huckabee has previously expressed support for efforts to improve America's eating habits, himself having once weighed in at 280 before shedding 110 pounds in 2004. He's also the author of the 2005 healthy-lifestyle book, "Quit Digging Your Grave with a Knife and Fork." Palin's comments Sunday were in reference to a speech Michelle Obama delivered in July, during which she described her own upbringing when it came to food and exercise. "In the afternoon, there was no way we'd be allowed to lie around the house watching TV," she told the NAACP in a Kansas City speech. "Our parents made us get up and play outside." "As I tell my kids, dessert is not a right," she added. Finally, one repub said not everything President and his wife said is wrong. I only hope and wish Palin go away. It would appear safe to think at this point CNN is obsessed with Palin, not a day passes anymore that the Ticker does not include her. I am Canadian so I don't have a dog in this fight so to speak – but I cannot grasp what people see in this woman; I'm not going to attack her daughter or her beliefs, but not once have I heard her offer a single solution or answer fully any question put to her. Sorry folks, on this one, I just don't get it. Feel free to explain it. Ha! So what do you say about that Sarah?? Of course, next thing you know she'll be accusing Huckabee of being a RINO – puhleeze ... give me a break – that man is about as far from being a RINO as one can get. Sara Palin as commander-in-chief would pass out cookies, no stinking govment going to tell us what to eat. More than a quarter of young adults are unable to meet physical requirements to join the military, creating a potential threat to national security, a group of retired armed forces leaders said Tuesday. "It's not drug abuse, it's not asthma, it's not flat feet - by far the leading medical reason is being overweight or obese," said retired U.S. Air Force Lt. Gen. Norman Seip at a news conference. About 27 percent of young adults are medically ineligible for the military, according to Mission: Readiness, a group of retired admirals, generals, and other senior military leaders. Good news. We need more Republicans to point out the the idiotic opinions of one of their own. Hmm, interesting when coupled with the military report that 75% of people are physically unqualified for military entrance. Just like everything Palin stands for, it may feel good, but that doesn't mean it is. No taxes would feel great until our economy collapsed. Cookies taste great until you can't get off the couch.